Windows Mobile is the legacy mobile operating system from Microsoft for smartphones and Pocket PCs, which was superseded by Windows Phone in 2010. Nonetheless, if you still have a device running Windows Mobile, and would like to modify the registry settings of Windows Mobile, the free PHM Registry Editor is a nifty tool for it, as Windows Mobile does not have any registry editor built-in. PHM Registry Editor was developed by Philippe Majerus but the download has been removed since the website revamp. However, the app works fine on all version of Windows Mobile, from the latest version available, Windows Mobile 6.5, to older versions such as Windows Mobile 6.1, 6.0, 5.0 and etc. 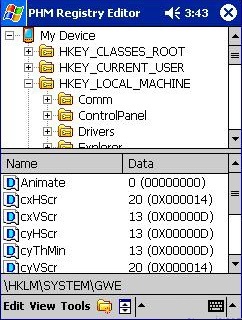 PHM Registry Editor allows you to edit the Windows Mobile’s registry where all its configuration and tweaks are stored. Explore the registry to find the operating system and applications’ configuration. Modify system and applications tweaks not available from the standard options screens. Backup and restore the complete registry. The latest version of PHM Registry Editor version 0.70.